Boardwalk Empire Season 3 reviewed: Troy Patterson on the HBO drama. A Sicilian hothead brings life to Boardwalk Empire. Still by Macall B. Polay/HBO. Boardwalk Empire (HBO, Sundays at 10 p.m. ET) may be the least thrilling good show on television. Even as its Prohibition-era malefactors flash cold razors and wet grins in its persistent gray-green gloom, an emotional stillness reigns—and it’s especially airless when we leave New Jersey to attend to Al Capone’s Chicago. The sense of stasis is enough to make one think of the show as the pay-cable equivalent of a tableau vivant—of the old popular art form involving models, deliberately posed and precisely lit, who illustrated a historic scene with great elegance and no action. But a compelling new character struts into vice-gripped Atlantic City in the opening scene of the show’s third season: Gyp Rosetti, a Sicilian-born, New York-based bootlegger played by Bobby Cannavale. As the season premiere begins, Gyp is on his way to a party that A.C. overlord Nucky Thompson (Steve Buscemi) is throwing to ring in the new year of 1923. Or he would be on his way, had not his car broken down on an oceanside road, where the sound mixers make the surf crash and the gulls cry with a poetic melancholy cribbed from Italian neo-realist cinema. A mechanic is working on the problem, but when Gyp reveals his ignorance of a phrase related to engine oil, the mechanic slightly scoffs—thus inviting the scoffee to demonstrate his comparably sophisticated understanding of non-approved uses for a tire iron. It is a small but crucial bit of business—a first step toward dramatizing the new wiseguy’s insecurity about the limits of his power and the latest indication of the series’ keen interest in exploring power’s relationship with language. Your favorite Boardwalk Empire moments may include Michael Stuhlbarg’s displays of felonious sangfroid—so cool that it’s clammy—as the man who fixed the World Series; the long stares with which Kelly Macdonald, as Nucky’s wife, searches the middle distance for the truth of her marriage and doesn’t like what she sees in herself; and all the lewd moues that Paz de la Huerta, as Nucky’s girlfriend, has made with her lubricious lips. The appearance of Rosetti—who flourishes a temper that may yet place him in the same league as James Caan’s Sonny Corleone or Joe Pesci’s Tommy DeVito—introduces a necessary hothead to a narrative in which all the killers tend to look cold-blooded or simply bloodless, especially since Nucky murdered his traitorous right-hand man Jimmy Darmody (Michael Pitt). Boardwalk Empire is in the tradition of gangster stories that treat their principals less as tragic heroes than as troubled businessmen, and there’s something businesslike in its handsomely mannered approach to elaborating underworld myth. But while the series’ showgirls and concubines continue to loll about like nymphs in tableaux vivants of the Flo Ziegfeld type, the season’s most intriguing storylines concern women who are not content to serve as decoration. A line of chatter about a pioneering aviatrix runs through the season opener. The writers, with a slightly heavy hand but a very clear head, set up an airborne metaphor about the 1920s, when not only flappers were spreading their wings, and they give Macdonald room to soar as she explores her freedom and its limit. 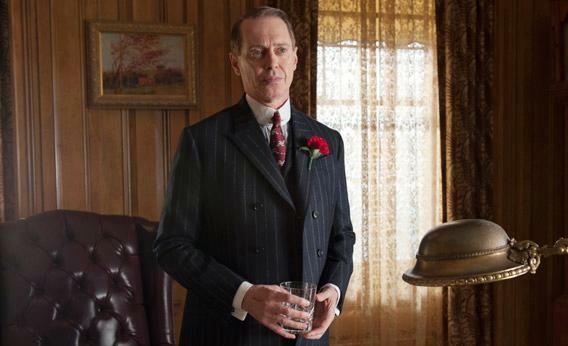 When Boardwalk Empire is dealing with the consequences of the 18th Amendment, it plays like a sound and steady drama. When addressing the energy around the 19th, it begins to jazz things up.